Our pulsation system is one of the few examples of its kind currently on the market, anywhere in the world. We have kept the system simple for one reason. Reliability. "Once the pulsators are set they require no technical service to keep them performing the same as the day they were installed." Pairs of bail clusters receive vacuum by a single sliding pulsator. In turn, each pulsator operates as a slave on a master assembly, driven by a single motor. 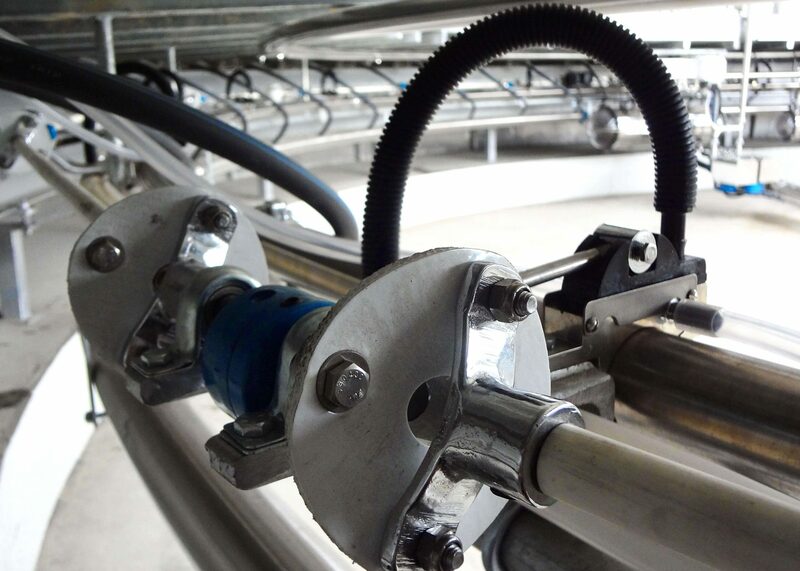 To ensure uniform pulsation throughout the parlour, every second pulsator operates with a pre-set phase offset. The offset being a function of half the number pulsators in the system divided by 360°. Effectively, neighbouring pulsators then operate at 180° offset. For this reason milk flow throughout milk lines tends to be uniform, which, in essence, helps minimise surging. Pulsator air admission is via large diameter (12 mm) nylon valves which vent directly to the atmosphere. Because of the size of the valves, pulsator blockages tend to be very rare. In fact, the system is so foolproof that there is no need for pulsator filters at all. And as a result, vacuum levels remain stable over time regardless of ambient air quality. We guarantee our pulsator body and slide for 10 years. However, they are likely to function for decades beyond this. In fact, in some dairies our pulsators continue to work perfectly despite 30 years of use without any servicing at all. Our pulsators withstand flushing with water and operate in any temperature. They will keep delivering vacuum with the same pulse cycle time and time again. This remains true even if vacuum levels fluctuate due to a worn blower of liquid ring pump. Our system is available in both simultaneous (4 x 0) and alternating (2 x 2) pulsation configurations. Simultaneous pulsation, whilst being simpler compared to alternating pulsation, has the disadvantage of producing greater variation of teat-end vacuum level, however. This is because milk flows in bursts away from the udder according to peak vacuum levels. Alternating pulsation overcomes this and for that reason we recommend it when setting up new dairies. In doing so it is gentler on the teat and helps to prevent surging in the milk line. For cow dairy milking, our rotary and herringbone milking systems operate at a nominal 56 pulses per minute at 38-50 KPa. A typical working range being 52-60 pulses per minute. When measured at the 4 KPa level, pulse ratios are 55-65 % for vacuum-on phases (increasing and maximum phases) and 35-45 % for vacuum-off phases (decreasing and minimum).